When French molecular biologist Patrick Merel, Ph.D., decided to establish a biotech company to develop and market a smartphone software program to store and display an individual’s DNA sequence, he moved to San Diego from Bordeaux, France. “Biotech Beach’s” genomics expertise and its growing prowess in the relatively new field of mobile health (mHealth) drew him to the city. “Genomics is top of mind in this city, and wireless medicine also is here. Where else in the U.S. can portable genomics have a better situation?” said Dr. Merel, founder and CEO of the Portable Genomics San Diego’s large footprint in genomic science also persuaded BioNano Genomics to relocate to the area last year from Philadelpha. Early next year, the company plans to launch its first product, a novel nanochannel technology platform for high-resolution, single-molecule analysis of long DNA sequences, said Erik Holmlin, Ph.D., BioNano Genomics president and CEO. Russell M. Lebovitz, M.D., Ph.D., a venture partner with DFJ Mercury, a seed and startup venture capital firm headquartered in Houston, recently moved from Texas to San Diego because of its lifestyle as well as its vibrant life sciences community. “San Diego is a nice place to live and relax between trips,” said Dr. Lebovitz, who travels extensively, particularly to San Francisco, for his work, which includes serving as CEO of Marval Biosciences located in both Houston and San Diego. San Diego, whose weather is mild and sunny much of the year, is headquarters for two of the world’s industry giants in genomic sequencing, Illumina and Life Technologies, as well as numerous biotechs including Synthetic Genomics (SG), founded by J. Craig Venter, Ph.D.
Like many other San Diego life sciences companies, SG is located on the Torrey Pines Mesa in La Jolla, also home to several other biotech companies, including BioNano Genomics, and the city’s academic powerhouses, UC San Diego, The Scripps Research Institute (TSRI), Salk Institute for Biological Studies, and the Sanford-Burnham Medical Research Institute. In mHealth, San Diego’s assets include the West Wireless Health Institute (WWHI) and the Wireless-Life Sciences Alliance; Qualcomm Life, a division of the global telecommunications giant co-founded in 1985 by a UC San Diego professor; several mHealth start-ups including Portable Genomics; and Eric Topol, M.D., one of the leading thought leaders in applying mHealth and genomics to health care. Dr. Topol, who heads the Scripps Translational Science Institute, holds leadership positions at Scripps Health, TSRI and WWHI. With over 600 biotech and medical device companies, San Diego’s life sciences ecosystem began in 1978 with a company that no longer exists. Hybritech, founded by two UC San Diego researchers, pioneered the commercial use of monoclonal antibodies. Hybritech’s legacy product is the first antibody test for the early detection of prostate cancer. In 1986, Eli Lilly & Co. purchased the company for over $400 million, creating a group of San Diego multimillionaires who subsequently nurtured dozens of other San Diego start-ups, including the successful biopharmaceutical company Idec. Founded in 1985, Idec developed Rituxan®, approved by the FDA for the treatment of several cancers as well as rheumatoid arthritis. In 2003, Idec merged with Cambridge, MA-based Biogen to form Biogen Idec. The closing of Idec’s headquarters in San Diego, to locate Biogen Idec in Cambridge, was a tremendous blow to San Diego’s life sciences sector. “It was another commercially successful company that left San Diego after it was bought out,” said Steve Flaim, Ph.D., referring to Hybritech as the first departure. A veteran of academia as well as the pharmaceutical and biotech industry, Dr. Flaim today advises UC San Diego’s von Liebig Center for Entrepreneurism and Technology Advancement, chairs the San Diego Tech Coast Angels, and is an Entrepreneur-in-Residence in San Diego CONNECT Springboard program, which provides hands-on mentoring to entrepreneurs. Idec’s departure, however, did create a new San Diego startup, Eclipse Therapeutics founded last year by two former scientists to take advantage of the cancer stem cell research program that they headed at Idec. Today, San Diego’s leading biopharmaceutical company is Amylin, founded by Hybritech alums two years after Idec’s birth. Eighteen years later, Amylin launched two first-in-class diabetes medicines. Hybritech millionaires also founded Gen-Probe, which announced in April that it would be acquired by Hologic, based in Bedford, MA. According to the announcement, Gen-Probe will remain in San Diego. In addition to biotechs, San Diego’s life sciences cluster includes the R&D centers of several “Big Pharma” companies. The most recent addition is the Lilly Biotechnology Center, an amalgam of San Diego’s SGX Pharmaecuticals, and Applied Molecular Evolution. Located on the mesa is Johnson & Johnson’s Janssen Labs, which earlier this year set aside a portion of its 330,000 sq.ft. space to create a “no strings attached” life science innovation center, or incubator “to give companies the opportunity to invest their capital in research instead of infrastructure and to focus resources on progressing science instead of day-to-day operations,” according to Janssen. Nearby is Pfizer’s 33.5-acre cancer and ophthalmology R&D center. The FDA approved Sutent® for intestinal and kidney cancers was developed at Pfizer La Jolla. Pfizer is among the pharma companies strongly tied to the mesa’s academic institutions. In 2011, Pfizer announced that it would locate one of its Centers for Therapeutic Innovation at UC San Diego Health Sciences Center. The collaboration will invest up to $50 million over the next five years on drug development. In March, Merck announced that it will establish the non-profit California Institute for Biomedical Research (Calibr) on the mesa “to accelerate the translation of basic biomedical research into innovative, new medicines to treat disease.” Over seven years, Merck will provide up to $90 million for the institute, to be headed by the world-renowned scientist and biotech entrepreneur Peter G. Schultz, Ph.D.
Dr. Schultz, Scripps Professor of Chemistry at TSRI, headed the Genomics Institute of the Novartis Research Foundation (GNF) on the mesa until 2010. He wound up on “Biotech Beach” in 1999 when Novartis recruited him. At that time he was a professor of chemistry and a HHMI Investigator in San Francisco. Today, however, Dr. Schultz could serve as a spokesperson for San Diego’s BIOCOM, the world’s largest regional life science association. “There is a lot of scientific talent here,” said Dr. Schultz. Like many other leaders of San Diego’s life sciences ecosystem, he attributed the community’s collegiality to the density of research institutions. Dr. Schultz noted that San Diego’s four major academic institutions are open to collaborative projects such as the Sanford Consortium for Regenerative Medicine, which opened recently on the mesa. “There’s something very special about the synergy among the players here,” said Duane Roth, CEO of the non-profit Connect, which helps link San Diego’s inventors and entrepreneurs with the resources needed to be successful. Established in 1985, Connect has served as a model for similar organizations in the U.S.
Also within easy walking distance of TSRI is Ambrx, one of the biotechs co-founded by Schultz in San Diego. Stephen K. Burley, M.D., D.Phil., a biotech innovation consultant based in San Diego, served as Eli Lilly & Co.’s Distinguished Lilly Research Scholar until earlier this year. In his Lilly position and previous role as CSO at SGX Pharmaceuticals, Dr. Burley frequently traveled throughout Europe, Asia, and the U.S.
“San Diego is seen as a vibrant, successful biotechnology hub with an excellent talent pool,” said Dr. Burley, who came to San Diego in 2002 from Rockefeller University where he was the Richard and Isabel Furlaud Professor and a HHMI investigator. However, as a biotech hub, San Diego has several soft spots. 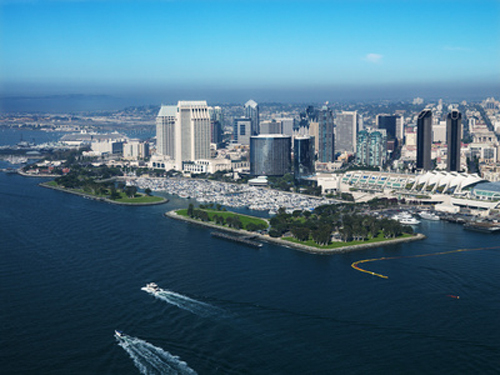 The Milkin Institute’s 2004 report, “America’s Biotech and Life Science Clusters: San Diego’s Position and Economic Contributions,” called attention to two of them: the lack of a well-populated indigenous venture capital community and the absence of large biopharma companies to anchor San Diego’s life sciences sector. A dense VC community is crucial because “private equity tends to invest in start-ups in their immediate area so that they can keep an eye on their investments,” said DFJ Mercury’s Dr. Lebovitz. On the way, a lot of companies fail. Ironically, biotechs typically do not fail early, but late “after a lot of investors’ money and time have been spent,” he pointed out. A biotech startup’s survival depends on its business expertise as well as its scientific talent, noted Dr. Burley. Providing San Diego’s entrepreneurs with the business skills and resources needed to be successful is the von Liebig Center for Entrepreneurism and Technology Advancement, the first commercialization facility of its kind in the U.S.
“The center is a valuable component of the San Diego life sciences ecosystem, but due to lack of financial support, it must operate on a shoe string,” said Dr. Flaim, who assists the National Heart, Lung and Blood Institute in developing programs similar to the von Liebig Center to advance cardiovascular medicine discoveries from the bench to the bedside. In its 10 years of operations, the von Liebig Center helped entrepreneurs develop 30 life sciences companies, “most of which are still up, running and successful,” noted Dr. Flaim. With stable, adequate funding support, there could be more.